.::IamZulaikha::. II: Degree in TESL Interview...... at UM?! 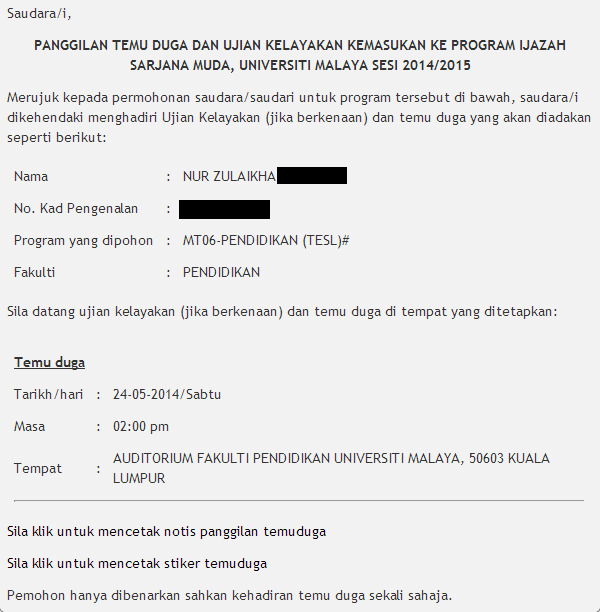 Degree in TESL Interview...... at UM?! So about twelve hours ago, the students who applied for first year degree in UM got to check on their application. I checked mine at about 4pm because I didn't know about it until my close friend, Ereen told me. She is called for the interview. Alhamdulillah. So it took a lot of patience on refreshing the page because many other were checking their results, all around Malaysia. I probably refreshed like 50 times or so. Alhamdulillah! I got called for interview! I was so shocked. I just didn't know what to think at that time. We're talking about UM, here. One of the top universities in Malaysia. Heck, it's University of Malaya. My father studied here. My sister studied here. Also, I've been here quite a number of times because of my sister. Visited her and such. Anyway, I went down and told my parents. "Ma, Ika dapat interview UM." The look on my mom's face was priceless. And then I asked if I should attend or not and she told me to attend. I was speechless. I mean, if I don't attend, I might be able to go to UiTM, where I've been for 8 months. But I guess Allah has His plans. I'm just going with it. If I don't get UM, I still have UiTM. In sha Allah. I told my friends and also someone. That someone happens to be in KL so, yeah. I was hoping to meet him on that day. We were planning on meeting in September or October but I guess we could meet in..... a week? I don't know. I'm so nervous. We've been looking forward to it and bam! NEXT WEEK. What is this. Lol. I guess I'll have to just go with it. Right. Serious stuff. The interview. I'm pretty nervous about it because I've been in a cave for almost two months. Hm. I need to start paying attention to the news. I need to brush up my speaking skills and my vocabulary. This is TESL, we're talking about. As much as I wanted UiTM, UM is better, in a way? I don't know. I don't mind getting these two, really. I'll just do my best for both and in sha Allah, He will decide which is the best for me. My other sister told me a couple hours ago that studying in UM might be a challenge because it's near to MidValley. Oh, the temptations! Imagine! Living in the middle of KL! EVERYTHING IS THERE! Sort of. If I really do pass the interview, I hope that I can make it through degree. I mean, UM is a whole new place. I might get culture shock all over again, like I did in UiTM. Hm. Please, please, please, pray for me. Pray that I'll get through life easily. I hope I can. With His guidance. I know I can. I still need to get closer to Allah. I hope that wherever I might go next, there will always be someone who keep me in track. Who remind me when I do something wrong. Who tell me to do good deeds. I really hope someone will be there, constantly reminding me. In sha Allah. I really want to change. Okay, that's enough for this entry. I guess I've been blogging quite a lot these days, huh? It's mainly because someone told me to. Well, I guess it's a good thing because then I'll be keeping in track of my life and my thoughts at the current situation. Plus, I can work on my writing skills. Heh. THIS IS A TESL STUDENT WE'RE TALKING ABOUT HERE. I still need to learn a lot. Okay. That's enough. Thank you for reading, if you did. I got accepted! Alhamdulillah. You can read about it here.